And remember, you have a MARK to make on the world. Dress accordingly. Today I'd like to highlight an upcoming event I'm proud to be a part of on December 4th: Survive in Style San Diego. A few words from the fabulous organizer, Analisse Concepcion: Survive in Style presents: Mind Body Soul, a day of healing, pampering, and fun, serving women cancer survivors. With all the ways that cancer de-feminizes, demoralizes and disempowers us, Survive in Style is taking a stand and taking back our beauty, our femininity and our future after having survived cancer. 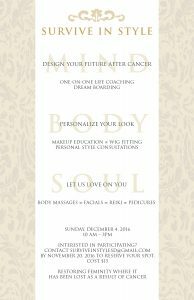 On Mind Body Soul day, our team will be offering guided meditation, makeup consultations, personalized styling coaching, and an exclusive pop-up boutique for 12-15 women cancer survivors in a beautiful private setting in the heart of downtown San Diego. Tickets start at $15 and spots are limited! Please email surviveinstylesd@gmail.com to reserve your spot.